Today we are excited to be kicking off a fun new series here At The Picket Fence! We know that you are busy, busy, busy! And as much as you love to craft and DIY it can be hard to find time between work, and soccer games and laundry and cooking dinner to sit down and actually create something! Now, don’t get us wrong we love creating more ellaborate projects BUT sometimes you just want to make something quick, easy and cute! That’s where our new series…Take 5: Five Minute Crafts comes in! Every FRIDAY we will be sharing a fun but simple craft that ANYONE can make the time to create! 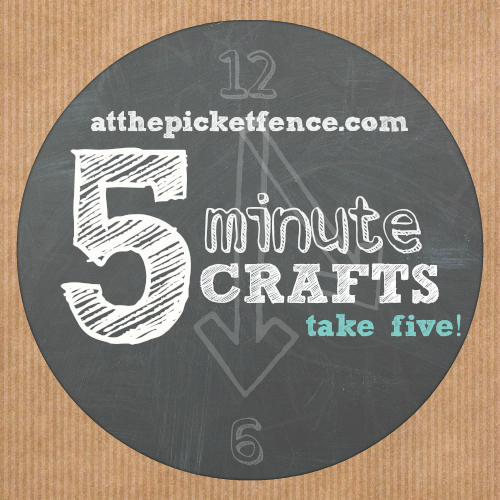 Even more exciting…once a month we will have a GUEST BLOGGER visiting to share their FIVE MINUTE CRAFT with you! 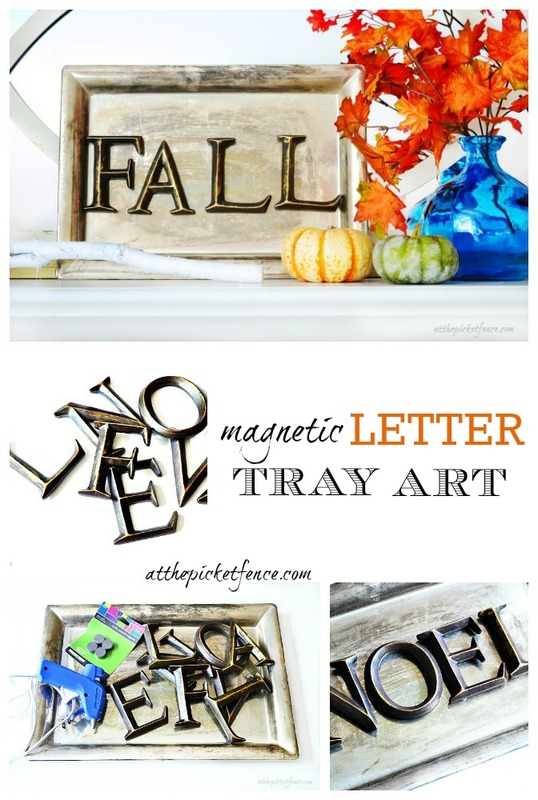 Up first, I’m sharing how to make this easy seasonal Magnetic Letter Tray Art! 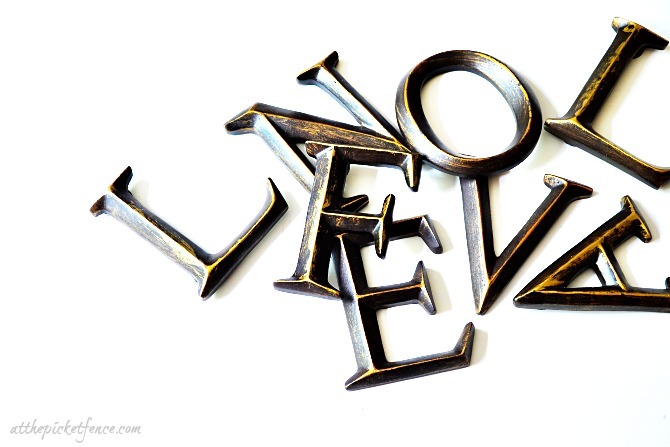 I just ADORE letters…I’m not sure if it’s the English teacher in me…or the little girl inside who buried herself under the covers with a flashlight every night to read just ONE MORE chapter. except maybe bronzed letters on a tarnished silver tray…. 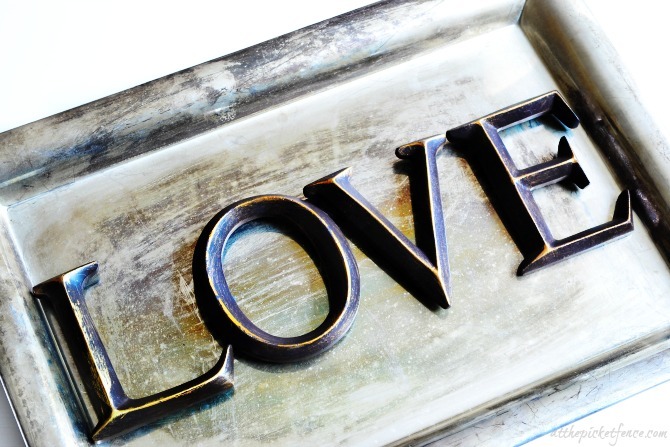 how about bronzed letters on a silver tray that spells out words? …a match made in Heaven! let your imagination lead you! Try some seasonal words like I did, just make sure they will fit on your tray. 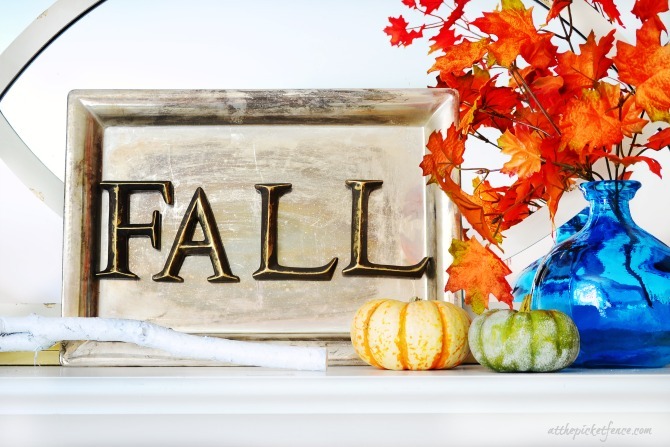 Words like FALL, AUTUMN, APPLES, LEAVES are perfect. Don’t forget Christmas and Winter are around the corner. 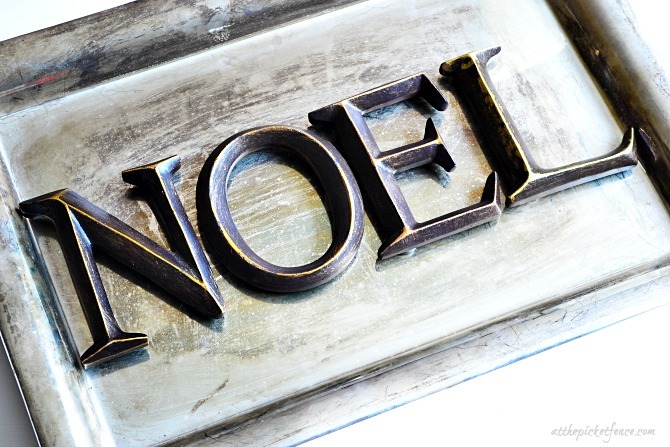 NOEL, JOY, SNOW or HO HO HO are perfect! and the list goes on…Valentine’s Day (LOVE), Halloween (BOO) so many ways to use this tray all year long! Stay tuned next week where we will be having a WEEK of PUMPKINS and I’ll be sharing a 5 Minute pumpkin project with you! We also want to announce the winner of the Libby Foods Slow Cooker Giveaway! CONGRATULATIONS to Sue Bradford Edwards! She was entry #85 which was tweeting about the giveaway. Sue, we will be in touch! Wishing you a fabulous Friday! See you back here soon…at the picket fence! 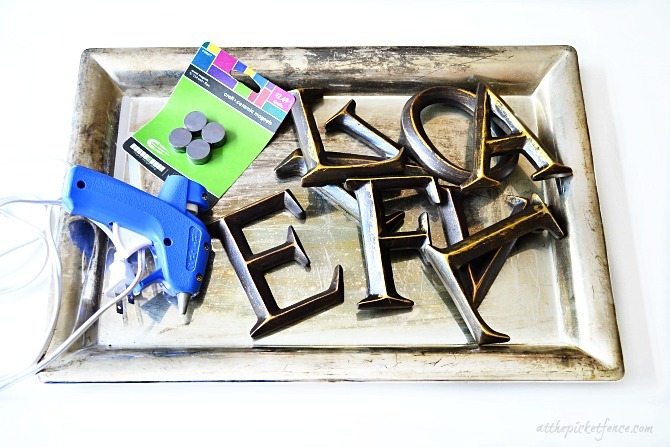 14 Comments on "Five Minute Crafts: Magnetic Letter Tray Art"
What a fun idea, Heather … they look awesome, and the possibilities are endless! Thanks for sharing! Love this idea…I’m not much of a crafter – but I think even I could get this done! I will look forward to this new series – thanks for sharing! Absolutely adorable! What a great idea. 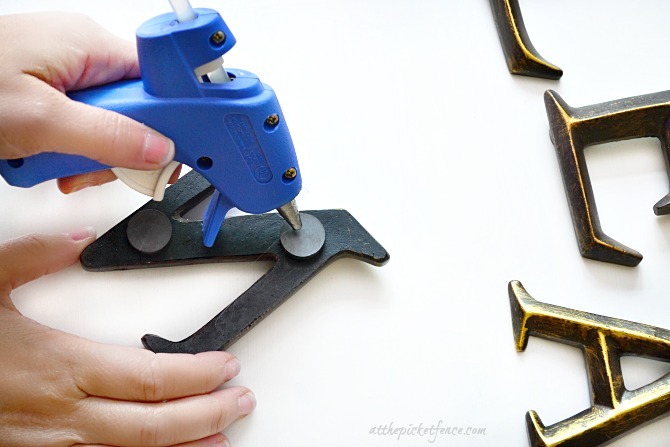 Gluing magnets to the back of letters I can handle. And I love the idea for five-minute crafts. I need stuff I can do quickly!! This is such a great idea ~ I love it! I’m going to have to make one for the kitchen. Really cute idea! I love how you can change the letters around! Excellent series idea & project. So cute!! Easy and fast, I’m excited for this series! 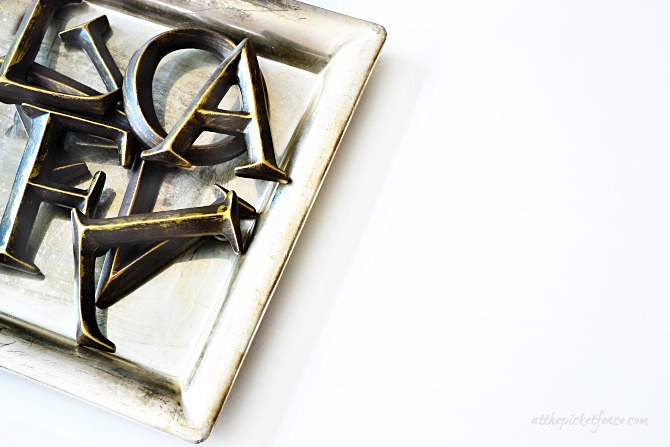 Silver is not a magnetic metal, so the magnetic letters will not stick to a silver tray. I really like the look, so I am going to try removable glue dots and hope they hold (unless someone has a better idea). Or, perhaps I can find a metal tray that will hold a magnet. It is still a great look! Love this project, Heather! Love that it is so interchangeable too.